November 2014 is a fun time to be a wrestling fan. Don’t get me wrong. WWE Survivor Series 2014 looks to be another lame duck special event just like Survivor Series has been for years now. Likewise, any news about TNA, such as the company moving from Spike to the considerably less popular Destination America looks to be a bummer. No, if you are looking to the American big leagues as your only source to have fun as a wrestling fan than you are limiting yourself something fierce. Especially since so much young and exciting talent has yet to appear in WWE or TNA. Mexico is producing some great matches and aside from the regular AAA and CMLL shows, Lucha Underground is an emerging and exciting product. Likewise, while NJPW may be getting the most attention among Japanese companies by far, there is just so many talented Japanese wrestlers it is worth looking at more than just one company. Lastly, indies the world over produce so much entertaining and engaging material that it is impossible for any fan to absorb it all. So, in no particular order, here are six tremendous wrestlers under 26 worth checking out! Chii Tomiya aka Micro is a 23 year-old joshi wrestler. At her most active from 2009 to 2011, Tomiya wrestled over 100 matches. In recent years this 4’8″ wonder hasn’t been nearly as busy, but is far from retired. Trained by 1990’s joshi star Emi Sakura and the flamboyant Keita Yano, Tomiya got her start wrestling for the Ice Ribbon promotion. At Ice Ribbon, Tomiya held gold on two occasions. First as co-holder of the Ice Ribbon Tag Team Championship with Isami Kodaka in 2010 then as Ice Ribbon Internet Wrestling-19 Champion in 2011. Tomiya popped up for her first notable match in months at a 666 show on November 1 where she teamed with GENTARO against Kana and NENE mugen D.a.i. in a winning effort. Astral is the current holder of the CMLL World Mini Estrella Championship, which he won back in September in a two out of three falls match against Pequeno Olimpico. The nephew of 23 year veteran Pierrothito, who he has worked matches with, Astral has wrestling in his blood. Astral stands taller than his uncle, barely qualifying as a mini at 5’3″ and about 150 lbs. This month Astral has won a variety of tag matches in CMLL teaming with the likes of Ultimo Dragoncito, Electrico and Shockertcito. Astral also goes by the name Pequeno Oro, which means, “small gold” in English. If Astral keeps his work ethic up his current championship will not be his last. Perhaps one day he will be known as Mucho Oro. Happy Motel is a stable which formed this year in Dramatic Dream Team (DDT) in Japan. The group is made up of 36 year-old experienced comedy wrestler Antonio Honda and the younger duo of Tetsuya Endo and Konosuke Takeshita. Still a teenager at just 19 years-old, the most junior member of the group, Takeshita debut in 2012 and has consistently demonstrated technical skill nearly unknown among newly budding performers. For the Tokyo Sports awards he was named rookie of the year in 2013 and nearly received the same honor from the Wrestling Observer Newsletter awards, but came in second, below Yohei Komatsu. Takeshita has wrestled exclusively for DDT since beginning his career and with the company he has held two titles. For seven days Happy Motel held the DDT KO-D Six Man Tag Team Championship. More recently in September Endo and Takeshita won the DDT KO-D Tag Team Champioship and their run continues to this day. As a singles performer Takeshita enjoyed success mere days ago when he nearly won the DDT Sumo Tournament Akibasho at Korakuen Hall before falling to the always powerful Shuji Ishikawa in the finals. Agile, athletic and unstoppable are just a few ways to describe Eita Kobayashi. 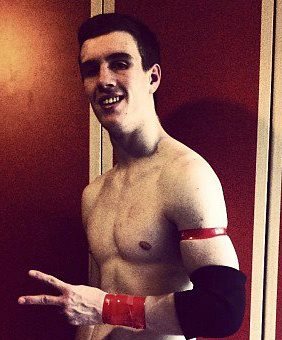 The 23 year-old Dragon Gate (DG) wrestler is on course to wrestle over 100 matches in 2014, which will be his third year straight wrestling a number of matches in the triple digits. This dude has tremendous range excelling as a technician, but also capable of hitting hard. In July Eita won the DG Open the Twin Gate Championship with his Millenials’ stablemate, T-Hawk for the second time. Earlier this year Eita also had a 90 day stint holding the DG Open the Triangle Gate Championship with T-Hawk and U-T. While Eita has earned plenty of kayfabe prizes he has also enjoyed critical acclaim from fans of Japanese wrestlng throughout the world. In 2012 he notably achieve third place in the rookie of the year category for the Wrestling Observer Newsletter awards. In between the Observer honor and his more recent success Eita wrestled for over a year for the International Wrestling Revolution Group (IWRG) and has had various matches in notable companies like Dragon Gate USA (DGUSA), EVOLVE and even AAA. And no, he’s not related to WWE NXT’s Hideo Itami aka Kenta Kobayashi! Wrestling out of Rainham, Essex, England, Will Ospreay has been making a splash in 2014 particularly in the last few weeks. Ospreay has not been known to stay exclusive to one wrestling promotion so it should come as no surprise this year Ospreay has wrestled for more than ten companies. These are not small entites either, but rather some big names in the business like Combat Zone Wrestling (CZW), Westside Xtreme Wrestling (WXW) and Preston City Wrestling (PCW). That is not to say Ospreay has only wrestled a match or two for each of the places he has worked. For instance, the United Kingdom’s Southside Wrestling Entertainment (SWE) is where Ospreay has worked most often in 2014 with over a dozen matches under his belt including some with some top tier indie talent. Just three notable names Ospreay has worked with include Christopher Daniels (as Curry Man), Roderick Strong and Zack Sabre, Jr. The 21 year-old Englishman also has some straps to carry around. On October 25 Ospreay won the SWE Speed King Championship. Less than a week earlier for England’s Revolution Pro Wrestling (RPW), he won the RPW British Cruiserweight Championship in London from Josh Bodom in a match also involving Rich Swann. AJ Styles may have to watch his back because the 630 splash this high flyer delivers is simply phenomenal. Also, he is insane. If Lucha Underground becomes a true force to be reckon with not just on the American wrestling scene, but in wrestling in general then Fenix’s career will only continue to soar. This Mexican 23 year-old will be celebrating his tenth year in the business in 2015, but with the pace Fenix sets for his matches it just makes sense he would still be so young while celebrating such a milestone. Fenix’s highlight reel making moves like the Fenix driver and Spanish fly may be career risking in less capable hands, but this luchador looks to have a lengthy career. The man is a master acrobat. 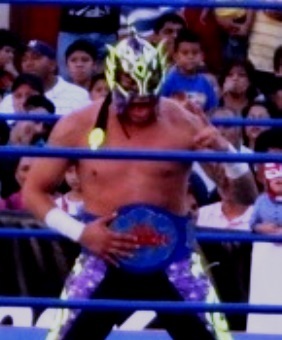 The baby brother of fellow AAA performer Pentagon, Jr. and journeyman wrestler Ikaro, Fenix has already had a small taste of AAA gold by winning the AAA Fusion Championship in 2013. Although AAA’s somewhat oversaturated title scene gave good reason for this title to be made inactive, Fenix continues to have action packed bouts. Fenix has also traveled a fair bit as in addition to the Lucha Underground Los Angeles tapings, in September 2013, Fenix wrestled 11 matches in less than two weeks for NOAH. Arguably the highlight of these showings was a singles match for the GHC Junior Heavyweight Championship with Taijiri Ishimori, which was also the final performance Fenix gave before returning to Mexico. More wrestlers under 26 from around the world can be found here and here. Tags: 6 Tremendous Wrestlers Under 26, 6 Tremendous Wrestlers Under 26 series, 666, AAA, AAA Fusion Championship, AJ Styles, Antonio Honda, Astral, Chii Tomiya, Christopher Daniels, CMLL, CMLL World Mini Estrella Championship, Curry Man, CZW, DDT, DDT KO-D Six Man Tag Team Championship, DDT KO-D Tag Team Championship, DDT Sumo Tournament Akibasho, Destination America, DG Open the Triangle Gate Championship, DG Open the Twin Gate Championship, DGUSA, Dragon Gate USA, dragonsystem.wikia.com, Eita Kobayashi, Electrico, Emi Sakura, England, Essex, EVOLVE, Fenix, GENTARO, GHC Junior Heavyweight Championship, Hideo Itami, Ice Ribbon, Ice Ribbon Internet Wrestling-19 Champion, Ice Ribbon Tag Team Championship, Ikaro, Impact Wrestling, Isami Kodaka, IW, IWRG, Japan, Josh Bodom, Kana, Keita Yano, Kenta Kobayashi, Konosuke Takeshita, Korakuen Hall, London, Los Angeles, LU, Lucha Underground, Mexico, Micro, Millenials, NENE mugen D.a.i., NOAH, NXT, PCW, PCW (United Kingdom), Pentagon Jr., Pequeno Olimpico, Pequeno Oro, Pierrothito, Rainham, Rich Swann, Roderick Strong, RPW, RPW (United Kingdom), RPW British Cruiserweight Championship, Shockertcito, Shuji Ishikawa, Spike, SWE Speed King Championship, T-Hawk, Taijiri Ishimori, Tetsuya Endo, thebritishwrestlingrevival.wordpress.com, TNA, Tokyo Sports awards, Two Out of Three Falls Match, U-T, Ultimo Dragoncito, United Kingdom, Wikipedia, Will Ospreay, Wrestling Observer Newsletter awards, WWE, WWE NXT, WWE Survivor Series, WWE Survivor Series 2014, WXW, WXW (Germany), Yohei Komatsu, YouTube, Zack Sabre Jr.